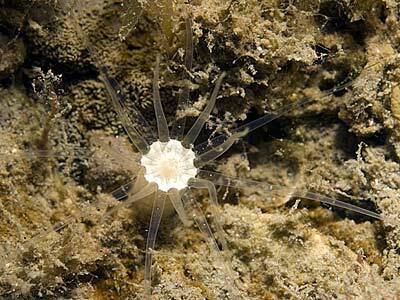 Description: This burrowing sea anemone has an elongated and worm-like column which is divided into a scapus and scapulus. The scapus has a soft, adherent cuticle, and a naked rounded base. The tentacles are very long when fully expanded, 16 in number, arranged in two distinct cycles (each having 8 tentacles). 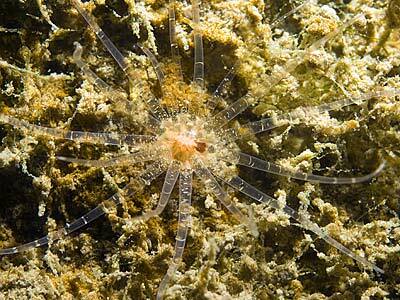 Length of the column is up to 100mm when fully extended, span of tentacles to 50mm. The disc is speckled buff with tiny orange spots, tentacles transparent with white spots and smaller dots of brown. 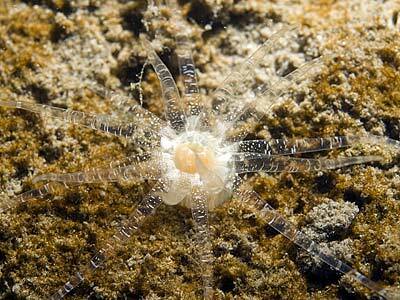 Habitat: Burrows in mud or sand; when expanded only the disc and tentacles protrude above the substrate. 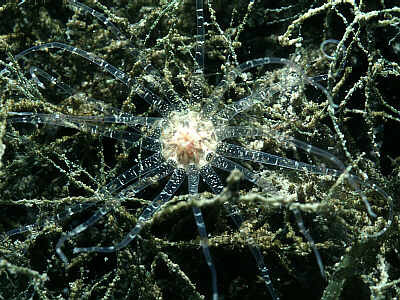 Occurs in sheltered situations in shallow water, or offshore down to 50m or more. 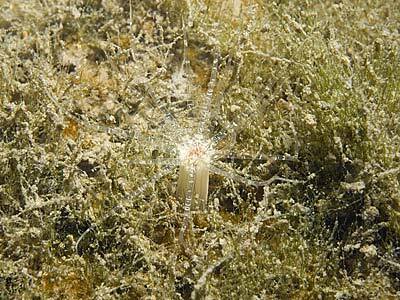 Often in beds of eel-grass. Retracts very quickly when disturbed. Distribution: Frequent on all western coasts of British Isles and around southern Europe to the Mediterranean. Records for North Sea require confirmation. Similar Species: A similar species Edwardsia delapiae, is known only from southwest Ireland. Compare with other Edwardsia spp. Differs from Scolanthus callimorphus by having a naked basal end and different coloration. Elongated, worm-like column correlated to burrowing habit. 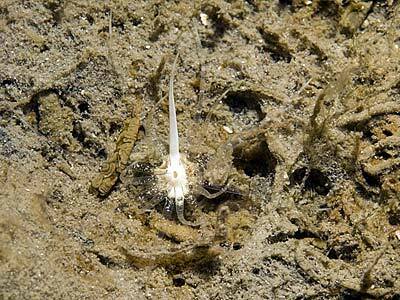 16 long, transparent tentacles, spotted with white and brown. Picton, B.E. & Morrow, C.C. (2016). Edwardsia claparedii (Panceri, 1869). [In] Encyclopedia of Marine Life of Britain and Ireland.